The most detailed survey of consumer attitudes about housing finds that while Americans are more optimistic about the economy, many are still wary of making a big financial commitment like a home purchase. 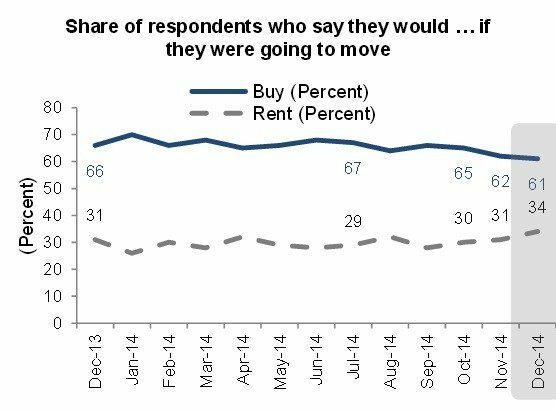 The share of consumers participating in Fannie Mae’s December 2014 National Housing Survey who say they would buy if they were going to move fell to 61 percent, an all-time survey low. Source: Fannie Mae National Housing Survey. 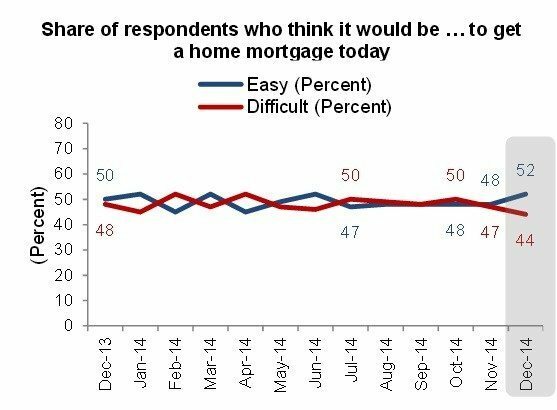 That, despite the fact that 52 percent of those polled think it would be easy to get a home mortgage — equaling an all-time survey high — and the share of consumers who believe the economy is headed in the right direction ticked up 5 percentage points, to 41 percent. Fannie Mae Chief Economist Doug Duncan characterized consumer housing sentiment as “moving sideways,” and said it’s not surprising that it’s lagging behind increased optimism about the economy as a whole. Given the long-term financial commitment that getting a mortgage represents, “Many prospective homebuyers want to be certain that their personal finances can withstand potential downside risks to the economy,” Duncan said in a statement. The percentage of consumers who expect their own personal financial situation to get better over the next 12 months fell to 45 percent. While 34 percent of those polled said their household expenses are “significantly higher” than they were a year ago, only 25 percent said their household income has seen a significant boost.